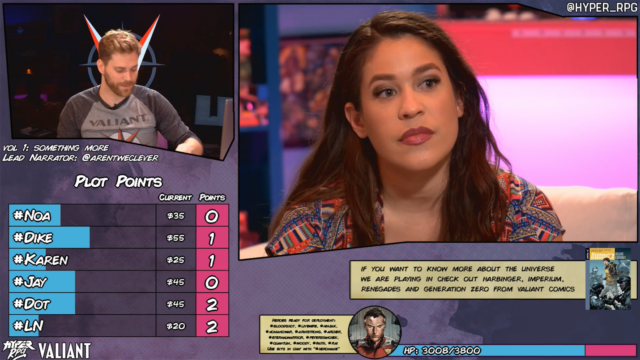 Valiant Digital is proud to announce that is re-teaming with Twitch’s Hyper RPG channel for VALIANT VANQUISHED: SEASON TWO – the next epic season of the live-streaming game show based in the world of Catalyst Game Labs’ best-selling VALIANT UNIVERSE RPG! Tune into Hyper RPG every Wednesday night at 12:30 am ET/9:30 pm PT for the latest, all-original adventure set in the Valiant Universe, as a fun-filled cast leads their role-playing characters through improvised stories featuring X-O Manowar, the Harbinger Renegades, Bloodshot, H.A.R.D. Corps, and countless more of your favorite Valiant heroes! Directly mirroring the events of THE ROAD TO HARBINGER WARS 2 – the prelude to 2018’s seismic crossover event, beginning this July in the pages of HARBINGER RENEGADE #5 by multiple Harvey Award nominee Rafer Roberts (Plastic Farm) and superstar artist Darick Robertson (The Boys, Transmetropolitan) – across a series of all-new campaigns, join Hyper RPG’s players live as they become battle-hardened veterans of the Valiant Universe’s next coming conflict with advance plot points and character profiles drawn from the upcoming firefight between Kris Hathaway’s Harbinger Renegades and Major Charlie Palmer’s H.A.R.D. Corps! Heroes, villains, and your favorite superhero universe collide like never before as the VALIANT UNIVERSE RPG from Catalyst Game Labs springs to life for an adventure of the ages…only on VALIANT VANQUISHED – airing Wednesdays at 12:30 am ET/9:30 pm PT on Hyper RPG! 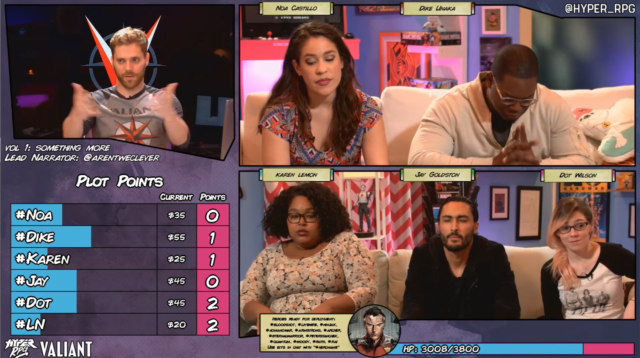 Also available now: Catch the entirety of VALIANT VANQUISHED: SEASON ONE now and watch the first episode of VALIANT VANQUISHED: SEASON TWO, directly on the official Hyper RPG YouTube channel! VALIANT VANQUISHED: SEASON TWO joins the ranks of a growing slate of digital-first projects from Valiant Digital – a division of Valiant Entertainment committed to producing scripted original content in live action, animation, and emerging media, created specifically for the digital arena. Valiant Digital’s first project, NINJAK VS. THE VALIANT UNIVERSE, is a brutal, first-of-its-kind, live-action digital series that will debut in late 2017. Tasked with expanding Valiant’s reach across social and digital media, Valiant Digital is the next strategic evolution of Valiant’s long-term plan to expand the ranks of its already sizable fanbase around the world. Plus: Follow THE ROAD TO HARBINGER WARS 2 into “MASSACRE” – a new, four-part assault beginning this July in HARBINGER RENEGADE #5! This summer, the march towards Valiant’s biggest and most impactful crossover event of all time starts here as multiple Harvey Award nominee Rafer Roberts (Plastic Farm) and superstar artist Darick Robertson (The Boys, Transmetropolitan) bring a newer, deadlier, and brutally efficient H.A.R.D. 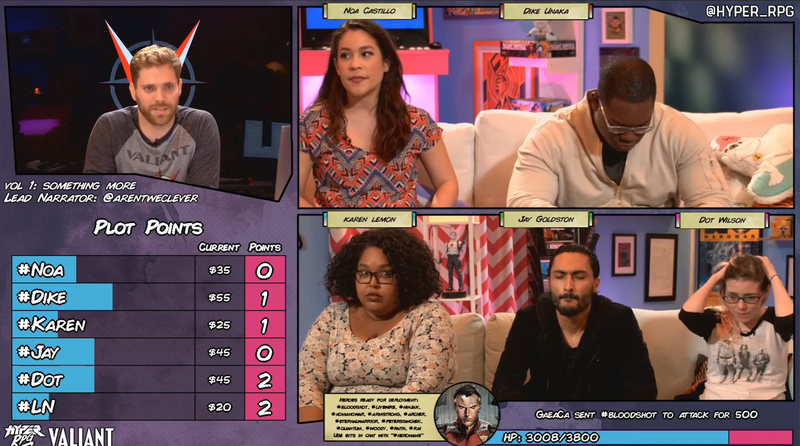 Corps crashing down on America’s renegade team of teenage superhumans! This summer, the Valiant Universe reaches a critical turning point as the H.A.R.D. Corps incites a “MASSACRE” that will reverberate for years to come…and each of the Harbinger Renegades stand on guard to honor the fall of a comrade in arms. Rafer Roberts and Darick Robertson begin THE ROAD TO HARBINGER WARS 2 with a bang, only in HARBINGER RENEGADE #5 – coming in July! Valiant Entertainment is a leading character-based entertainment company that owns the largest independent superhero universe in comics. With more than 80 million issues sold and a library of over 2,000 characters, including X-O Manowar, Bloodshot, Harbinger, Shadowman, Archer & Armstrong, and many more, Valiant is one of the most successful publishers in the history of the comic book medium. Today, the company’s characters continue to be forged in publishing, licensing, film, video games, and beyond. Valiant consistently produces some of the most critically acclaimed comics in the industry and has received numerous industry awards and accolades, including a Diamond Gem Award for Comic Book Publisher of the Year. Visit them online at ValiantUniverse.com.